Dedicated to the world of stickers it was no question that a charity event at Hatch would of course incorporate their favourite object of desire. For Oversized & Underpriced they’ve asked more than fifty artists to create an A3 sized “Hello My Name Is” sticker in their very particular styles. 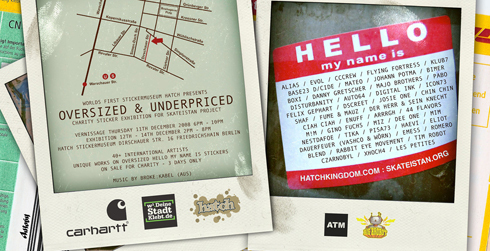 These single copies will be exposed and put up for sale from the 11th to 14th of December at Hatch. Two-thirds of the proceeds will be donated to the project skateistan.org and one third attends the sustainment of the museum. 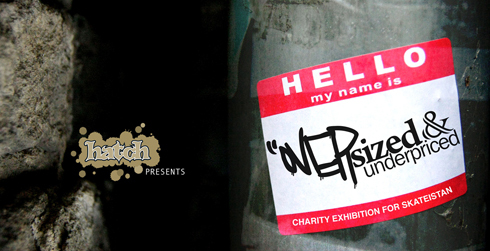 Each piece of art will be available for fixed price in support of a good cause! Vernissage: Dec 11th / 6 p.m.—10 p.m.
Exhibition: Dec 12th—14th / 2 p.m.—8 p.m.